Kitsap Music Teachers Association is the Kitsap County, Washington chapter of the Music Teachers National Association and the Washington State Music Teachers Association. KMTA also welcomes teachers from Jefferson and Clallam Counties. ♫ Are you looking for an experienced music teacher in Kitsap County, Jefferson County or Clallam County? KMTA teachers are dedicated to ongoing professional development. Visit our Find a Music Teacher page for a listing of teachers by name, instrument and location. Our teachers offer music lessons all over Kitsap County including Bainbridge Island, Bremerton, Kingston, Poulsbo, Port Orchard, Silverdale and Seabeck. KMTA also covers the communities of Port Ludlow, Quilcene, Port Townsend, Sequim and Port Angeles. Piano, violin, voice, guitar and flute are just a sample of the specialties taught by our teachers. Many have received professional certification through MTNA, the oldest music-teacher’s association in the U.S.
♫ Are you a Kitsap or North Olympic Peninsula music teacher looking for a professional association? Visit our Join KMTA page to become a member. Or come to one of our monthly meetings to meet other local music teachers and find out more about our association. Meeting locations are posted on our Calendar. We sponsor group recitals, music artistry and music literacy development and assessment events, competitions, scholarships, professional development workshops, an annual Music Carnival and more, all on the West side of Puget Sound. Since 1949 the Kitsap Music Teachers Association has been affiliated with Washington State Music Teachers Association (WSMTA) and Music Teachers National Association (MTNA). The mission of MTNA and its affiliates is to advance the value of music study and music making in society and to support the professionalism of music teachers. ♪ KMTA Teachers: Visit the Resources page to access downloadable WSMTA forms and information for the Music Literacy Program, Music Artistry Program (formerly Adjudications), scholarships etc. Read and respond to communications from KMTA, WSMTA and MTNA. Attend at least one chapter gathering a year. We want to know who you are! Personally participate in or assist with at least one KMTA event each year. Uphold the MTNA Code of Ethics. Share positive and constructive feedback with your Board. Make time to come to our monthly meetings, the second Friday of each month. You will network with other teachers and gain ideas to improve your teaching and studio practices through guest speakers’ presentations. Check the Calendar page for the schedule and location. If you would like to know more about any information presented on this website, or would like to connect with KMTA for any reason, please send an email using this form. Your email will be directed to the current President of the Kitsap Music Teachers Association board, a position which rotates every two years. To contact a Board Officer or committee chair about a specific event or issue, first refer to the Board Officers page, and then locate the person's email and phone number listed on the Find A Teacher page. 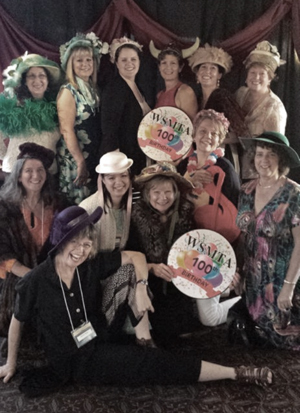 KMTA teachers celebrating WSMTA’s 100th Anniversary at the 2015 State Conference in Bremerton, WA, hosted by the Kitsap Chapter.